I’ve watched Stargate Atlantis since it started in 2004 (big fan) and I also very much enjoyed the Stargate movie from 1994 with Kurt Russell … but somehow I never got into Stargate SG1. I’ve wanted to start watching SG1 for a while, but I’d have to start from the beginning and 10 seasons were very intimidating. 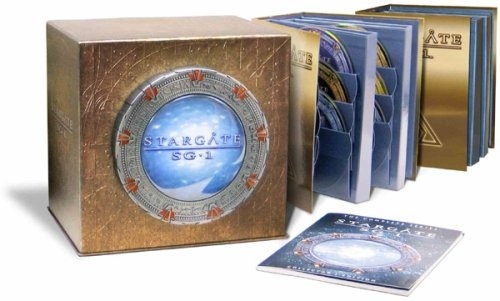 Throughout December Amazon had some incredible deals, including (for one day only) all 10 seasons of SG1 for only $99 (marked down from $329). I couldn’t resist this awesome deal and ordered the set. Next week is Atlantis’ final episode (boo-hoo! ), so this gives me a chance to catch up with SG1 until the third series starts this summer. A lot of the reviews on Amazon complained about the bad packaging of these DVDs – apparantly lots of folks got their boxset with many of their discs scratched – but I’ve inspected all 54 discs and they look okay. Last night I finished the first season, and all discs played fine. It’s great to know that the show is just going to get better, so I have a lot to look forward to. I must say that I’m a bit disappointed about the image quality of the episodes so far. The picture is very grainy, almost like they were transferred from bad VHS tapes. I hope that this will get better in later seasons. The first few episodes of the first season were a bit simple (Jack brings disease through Stargate), but as the season progressed the stories became more interesting. My favorite episodes were The Nox, Enigma and Solitudes, and the season finale three-parter was especially exciting (minus the lame flashback episode inbetween) with a major cliffhanger. Now I can’t wait to see the rest of them. This entry was posted on Monday, January 5th, 2009 at 5:17 pm CET and is filed under Television	with tags . You can follow any responses to this entry through the RSS 2.0 feed. You can leave a response, or trackback from your own site.